Firefighters respond to blaze at the Commons at Timber Creek Apartments on Sunday, May 13. 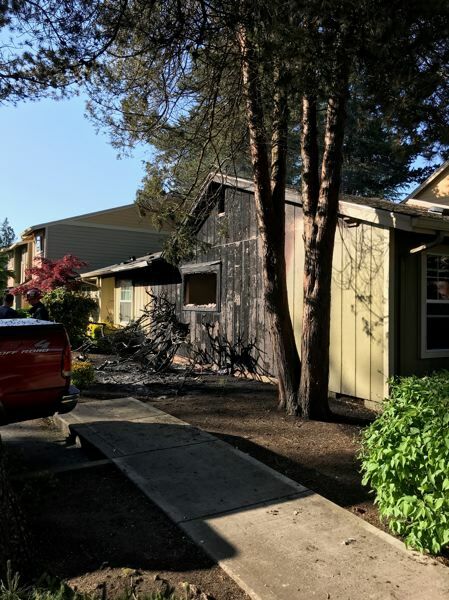 Eight people are homeless after a fire broke out around 4:49 p.m. at the Commons at Timber Creek Apartments on Sunday, May 13. Tualatin Valley Fire & Rescue dispatched to 12450 Northwest Barnes Road after reports of a commercial fire in a one-story apartment complex. "Fire (was) showing on the exterior of the building and possibly breaching into the attic," first responders wrote in a news release. "This fire was upgraded to a first alarm assignment which brings additional equipment and personnel to the scene which is needed on a complex incident like this." First responders say two apartment units were heavily damaged by smoke and fire, displacing two families. They say both units had working smoke detectors. The fire was knocked down by 5:24 p.m., according to a news release. No injuries were reported. "TVF&R would like to remind you that working smoke detectors save lives," the department wrote.